Author: Chris is an urban hydroponic hobbyist who uses hydroponics to maximize his 400 square foot yard and extend the short Chicago growing season. 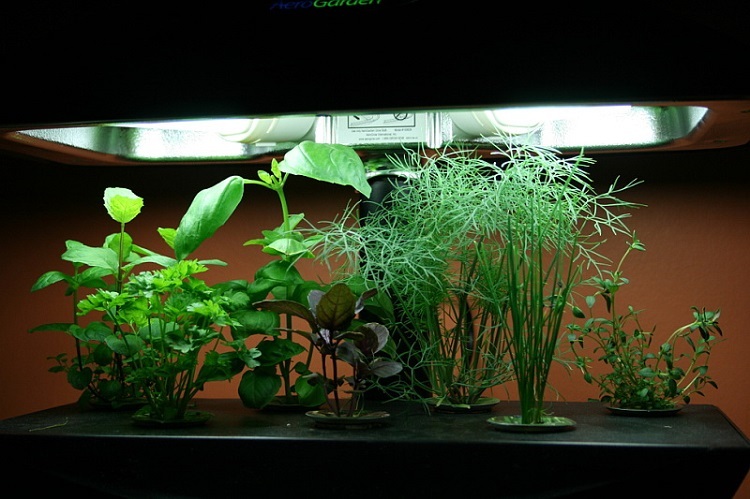 Chris blogs about his hydroponic experiences at HealthSmartLiving.com. Hydroponic gardening is a great way to grow your vegetables, fruits, and herbs under totally controlled conditions. You’ll hear many a naturalist extolling the virtues of growing food and perennials in the earth, under the sun. However, many of their arguments are misguided; defying logic and the great results obtained from hydroponic growers all over the world. Perhaps it is more “natural” to grow using nature, but you’re also at the mercy of many environmental and pest-related variables that you simply cannot control: humidity, heat (and cold), cloud cover, wind, and pestilence. An in-line pump then circulates nutrient enriched water through the plant’s root system, while overhead lighting allows the plants to complete the normal photosynthesis cycle they need to grow. The inert growing media gives you the freedom and control to be much more exacting about how much fertilizer the plant gets and provide the roots with much more oxygen as well. While soil grows can be a little more forgiving, the plants always end up being robbed of vital nutrients which limits their growth potential. If you’ve ever purchase hydroponic vegetables, you’ve probably noticed how much larger, juicer, and colorful they are. Soil based plants can’t use all of the nutrients we give them. As time wears on, certain elements begin to crystallize within the soil or are simply washed away, robbing the root system and over time, limiting the plant’s nutrient uptake. They take up to 50% less land to grow the same amount of crops: Leaving more land for other uses such as wildlife reserves and also saving trees, which would otherwise be cleared for agricultural purposes. Less water usage: In fact, less than 10% the amount that would be required for growing in soil. The only water lost with hydroponics is through evaporation, or occasional changes to the feeding solution. Reduced fossil fuel consumption: Food is shipped all over the world to places where agriculture is hard or impossible – or where certain foods cannot be grown due to shorter growing seasons. With hydroponics, you can grow those foods locally! Less pesticide use: Due to the fact that you’re growing indoors and eliminating soil (which hold bacteria and many common insects), there’s no need for toxic pesticides to protect your plants. Grow Area: Your grow area doesn’t need to be as big as it would for a soil-based garden. On average, each plant will require a 4 inch pot, with an inch or two in between each plant. You’ll also need space for your holding tank and room overhead to mount your lighting system. Setups: Search hydroponics on instructables.com for dozens of home made hydroponic systems with step by step directions. I hope this provides you with additional knowledge and interest in using hydroponics to lower your environmental footprint. I can be followed @healthsmartliv or emailed at thecaptain[at]captainhydroponics.com. Nice overview. The benefits of hydroponic gardening are plentiful. It’s not as easy as some think, however. It will take a while to find the right combination of light, nutrients, ventilation, etc., but once you have found the formula that works well, hydroponic gardening is very efficient. Hydrocarbon units in a design that is suitable for any environment. Pack them tight or space them out for your growing situation. Hey Chris, awesome share.. Sorry I am quite late to reply on your post. You have explained the environmental benefits of hydroponics in a very nice way. This knowledge will help many people who want to grow indoor plants in their house. I am one of such people who likes indoor gardening. These key considerations that you have mentioned have increased my knowledge and i will definitely share this with my family and friends. Hydroponics is environmentally friendly depending on what light source you use. most people use sodium lights for hydroponic plant growing and these lights are not very friendly to our environment at all. In just 3 months of running five 400 watt lights the electricity bill was £600.